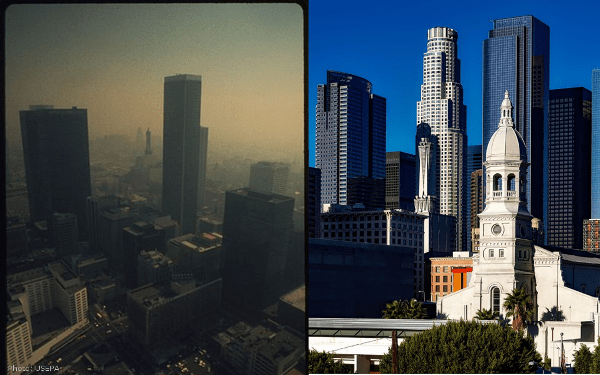 Above: Los Angeles in the 1970s and now. What does it take to get from dirty to clean? Learn here. Since Donald Trump became President and Scott Pruitt his EPA Administrator, the EPA has worked assiduously to remove, weaken, or delay a host of pollution-cutting rules. As a result, the agency is on a “reverse mission”. Instead of focusing on delivering what the public has always counted on the EPA to deliver – the protection of the environment and of human health from illnesses and premature deaths inextricably linked to pollution – the Pruitt EPA’s signature work is to deliver higher levels of pollution for longer periods of time. At the same time, the Pruitt EPA has created a set of markers pointing clearly to a larger, if less noticed, project of dismantling the EPA’s very ability to do its job. The depth of Pruitt’s commitment to this reverse mission is illustrated by the sheer volume of individual pollution reduction rules he has put the agency to work on withdrawing or delaying. Yet, even that inventory tells only part of the story. In fact, the Pruitt EPA seems to be working equally hard on dismantling its very capacity to develop, implement, and enforce effective pollution reduction rules and programs and to carry out other vital public service functions, like advancing scientific research, sponsoring projects that promote community environmental health, and providing the general public complete and accessible information about public health and environmental issues. He is also undermining the public’s legal right to hold the agency accountable when it fails to meet its obligations. If it continues, the Pruitt dismantling project will leave behind not just a pollution-control regime that delivers fewer reductions in health-threatening pollutants. It will also leave behind an agency that – even beyond a shriveled budget and losses in experienced professional staff – will be bereft of the very institutional tools that have proven indispensable to carrying out the agency’s mission. These changes will have the effect between now and the end of Pruitt’s tenure of undermining the EPA’s capacity to fulfill its public health and environmental protection obligations. While these many of these changes can be reversed by a successor administration, the task will present that administration with a much greater challenge at the very beginning of its tenure, diverting resources and attention to institutional repair and away from pressing programmatic work to address substantive health and environmental protection. We have begun to list and describe what amount to markers on the path to dismantling the EPA’s capacities. Below are many of the changes Administrator Pruitt has made to critical practices that the agency has relied on to carry out its public health, environmental and scientific mission. The list links to longer posts with more details. Thanks to these changes, Pruitt’s EPA has already willingly compromised its ability to ensure compliance by sources with pollution-reduction requirements – or even to detect non-compliance in the first place. It has blunted the public’s ability to hold the agency accountable for carrying out its obligations, diminished its capacity to access high-quality scientific advice, introduced politics into competitive public benefit grant-making, and curtailed the public’s access to critical information about environmental changes and hazards. Diminishing Public Accountability: The public’s ability to hold the agency accountable for meeting its obligation to implement the laws that protect public health and the environment from pollution has been diminished. See our post on the Settlement Policy Memo. Curtailing High Quality Science: The agency’s capacity to elicit objective and disinterested advice from highly qualified scientists and other experts – advice that is critical to a host of EPA obligations, including, for example, setting standards for what levels of toxic chemicals are safe for children and pregnant women – has been curtailed.See our post on Removing Scientists from Advisory Panels. Stepping Back from Air Program Enforcement: The agency has effectively announced its retreat from a crucial enforcement step against regulated sources that increase their air pollution, thereby abandoning its responsibility to ensure that these sources are not increasing how much they pollute. See our post on the New Source Review Enforcement Memo. Impairing Critical Information-Gathering: EPA’s nationwide network of regional and field offices can no longer move on their own authority to collect compliance information from polluting sources; instead, they must seek approval from EPA headquarters before acting, a change almost certain to introduce delay even where the Regions have reason to believe that sources are polluting at levels above their legal limits. See our post on Centralizing EPA’s Compliance Information Requests. Politicizing Grants: Competitive grant-making meant to provide resources to projects aimed at delivering public health education or reduction of environmental hazards that meet objective quality criteria are now, for the first time, subject to political review. See our post on Political Vetting of Grants. Hiding Science and other Information: The public no longer can turn to the EPA for complete access to scientific information now that the EPA has scrubbed a variety of its webpages to minimize or obscure information on subjects like climate change and hydraulic fracturing. See our post on Hiding Information. Article link: Can EPA Maintain Its Mission? In writing a paper for CSU Global related to the current and future rollbacks in the EPA, I too am concerned for a reversal in the progress made in clean air and health in our country. My paper has focused mainly on the automotive sector and the rollbacks made to the MPG goals for automobile fleets. While reversing these standards may have a short term economic impact and allow a brief reprieve in developing new technologies for the major US auto makers, allowing vehicles to stagnate in their current efficiencies or, worse yet, move in the opposite direction may have a long term or irreversible environmental and economic impact on the US and world. Chinese automakers may reap the benefits of these rollbacks as well if (and our recent impending trade war has potential to change where I was headed with my research) US investors move their money to Chinese auto makers who continue to move ahead in research and development of new tech. Even American parts distributors agree that the loss of investment in technology and the loss of jobs that leads to are a reason to keep the Obama administration rules in place. Rather than roll back these rules to drive American auto maker back to success, greater investments in new and emerging technologies would better equip America auto makers for long term success as well as to stay competitive in a global market. I propose, rather than undo decades of progress, that prior MPG fleet goals are reinstated (perhaps with a more realistic date to achieve them) and perhaps a team within the EPA is created to partner with US auto makers, tech companies and perhaps others in order to advance automobiles in new and beneficial ways.